Ted Ligety pointed his Audi onto the autobahn outside Munich Airport, speeding through Austria en route to Kranjska Gora, a small resort in northern Slovenia. 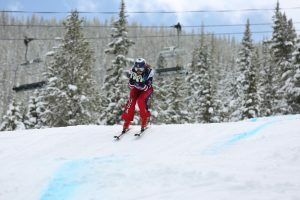 In his bag was the Olympic gold medal in giant slalom — a hard-fought prize that had taken him on the resultant whirlwind media tour in the USA. his Head skis sideways in the second run in Sochi, he never gave up. That was his approach to ski racing. It was remarkable that Ligety was even in this difficult position two weeks ago. Since his debut World Cup win in South Korea in 2006, he had failed to finish a GS only twice coming into this season. His last DNF was all the way back in 2009. But this year in both Val d’Isere and Adelboden, he failed to make the finish — 200 World Cup points tossed aside. Yet he still had a chance. Ligety came into Kranjska Gora the favorite with five career wins on the course. He amassed a half-second first run lead then survived a charge by Austria’s Benni Raich to take the win. Hirscher, meanwhile, was an uncharacteristic fourth. OK, there’s still a chance, with the margin now cut to 50 points. Still, Ligety wasn’t so sure. "At this point the giant slalom globe isn’t a huge goal of mine," he said. "I have to win and he has to falter, which is not a really good strategy. If it were anybody else besides Marcel I would say it’s doable. But Marcel is not the kind of guy that gives anybody any gifts." On to the World Cup Finals in Lenzerheide, Switzerland. The odds were long. Ted Ligety knew that. After the first run, Hirscher was off the pace in eighth, but only .30 of a second out. Ligety was in second place to Germany’s Felix Neureuther by .12. Ted needed a win. But he also knew he had one piece of luck on his side. The way the math was working, a tie in the season standings was a very real possibility. Ligety knew he had the tiebreaker based on more wins than Hirscher. The second run in Lenzerheide was true drama. Standing eighth, Hirscher put it all on the line to take the lead. One by one, no one topped Hirscher other than France’s Alexis Pinturault. Ligety knew his task. He needed to have the run of the season. And he did, posting the fastest time of the second run. Still, it wasn’t yet enough. He needed Felix Neureuther to slip into a narrow window of time — the .27 seconds separating Ligety from Hirscher. It was like spinning the roulette wheel in Vegas. As the German star arced his way down the course it was clear that Ligety had a chance at the win. But did the German have enough to drop in ahead of Hirscher? It didn’t look good. Across the finish. Ligety looked up at the scoreboard. By a mere one hundredth of a second, Neureuther had popped into third, Hirscher into fourth. Ted Ligety had claimed his fifth Audi FIS World Cup GS crystal globe. "I definitely knew at the start of the day that I had a chance, but you know it’s not a good chance when it comes to Marcel. The only way you can win is by winning. I knew it was going to be a major uphill battle for sure. I’m super thrilled. This is a goal every year to win the giant slalom globe but it was by the skin of my teeth today. It was a tough race this year. I was able to win but it’s a testament to the fortitude of Marcel to get on the podium in every race so I’m happy to walk away with it."